Come and get it! The finest Pork Ribs, seasoned with a special barbecue sauce and spices. Just heat and enjoy. 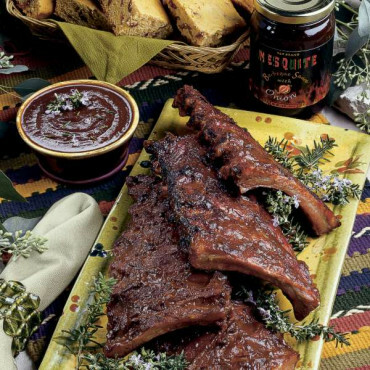 Also comes with a jar of our tasty Mesquite BBQ sauce and a package of Old Fashioned Cranberry Cornbread Mix. (Conventional Oven) Preheat oven to 375ºF. Remove ribs from package. Cover with foil and heat for 15 to 20 minutes. Remove the foil and continue to heat for another 15 to 20 minutes.